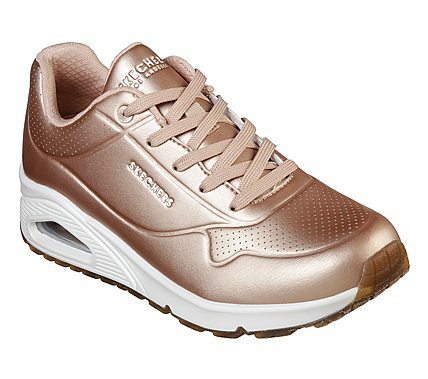 Put a new shine on a classic look with updated wearable comfort in the SKECHER Street Uno - Rose Bold shoe. Smooth metallic-finish leather-textured synthetic upper in a lace up classic fashion sneaker with stitching and perforation accents. Air Cooled Memory Foam insole, visible air cushioned midsole.